Hello everyone! 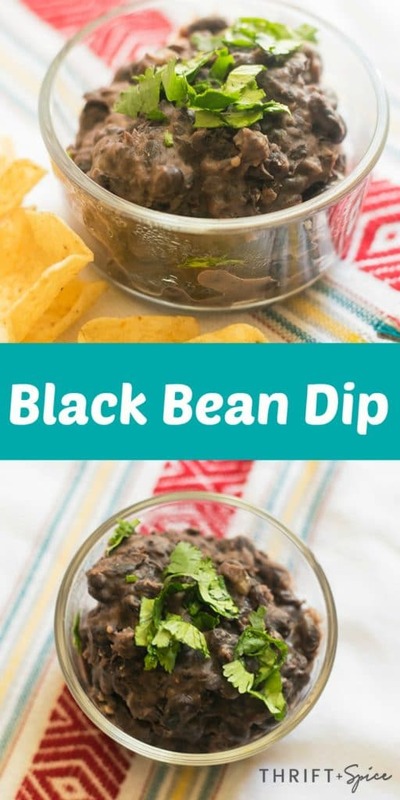 Today I have a delicious black bean dip recipe for you. 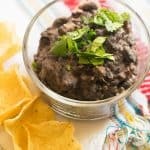 Black bean dip is incredibly easy to make and is made with ingredients you most likely already have on hand. It’s full of flavor and even a little spicey though you can totally omit the spiciness part if you wish. It’s perfect as an appetizer or snack and can be eaten as a dip or as a spread on crackers or bread. In just 30 minutes you can have this tasty and inexpensive dip on the table. Lately I’ve been eating a lot of dips. Dips are a favorite of mine. I could probably live on them. You see there’s so many different kinds of dips that I would never get bored. Recently I had buffalo chicken dip which is absolutely amazing! 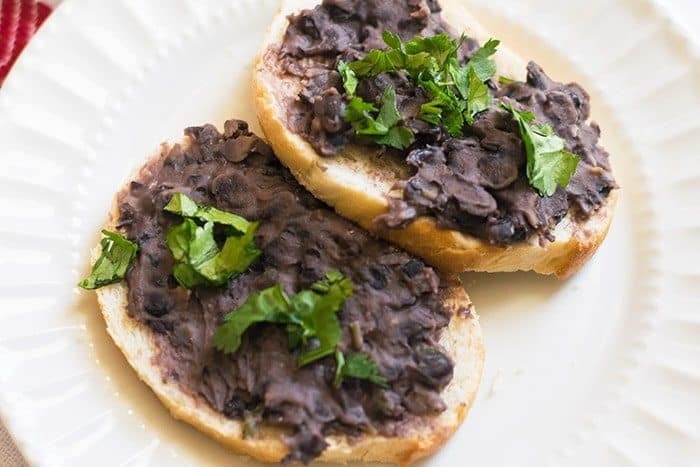 Black bean dip is also a favorite of mine and is very simple to make. There are many ways to make it. I noticed that a lot of recipes don’t require any cooking. I however prefer to cook my beans because it softens them up. 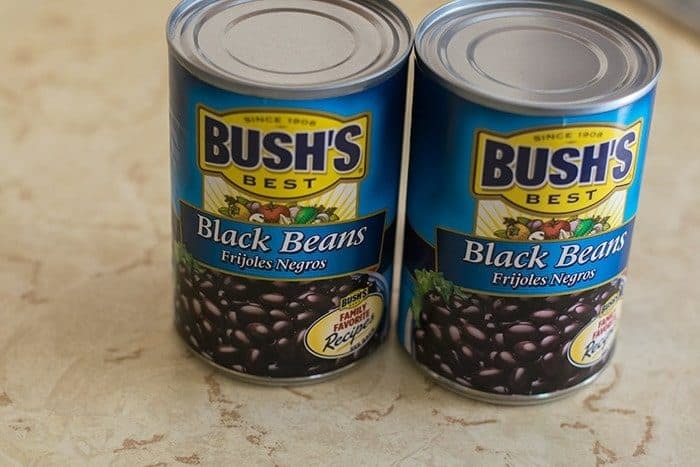 I use canned beans so of course they are already cooked but I don’t care for the texture of them straight out of the can therefore I cook them again. As you can see its made with common ingredients that you may already have on hand. I always keep bacon grease in my kitchen I use it probably way more than should. But I cook a lot of beans, greens, corn bread etc… which are foods that I believe NEED bacon grease. If you don’t have bacon grease you can always use vegetable or olive oil but the dip really benefits from the bacon grease. The first thing you want to do is heat up the bacon grease in a pot over medium heat. When the grease is hot add the onion and jalapeno. Saute for a couple of minutes. Season with salt and pepper. Open the canned beans and drain just one of them. Add the beans to the pot. Now add the garlic salt and cumin and stir well. Bring the beans to a boil over medium heat and cover. 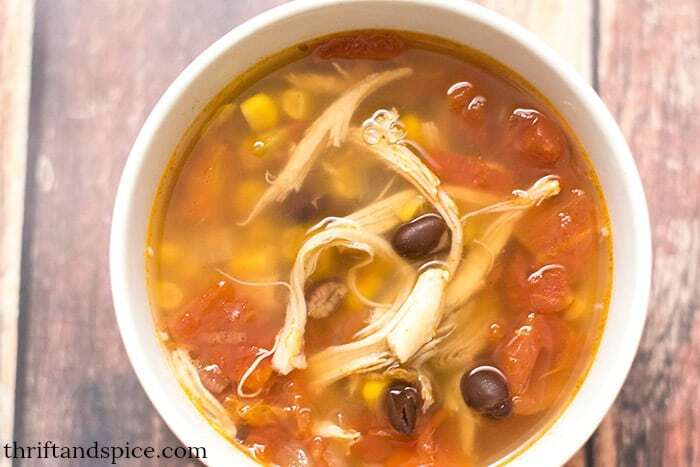 Reduce the heat to low and simmer for about 20 minutes. After simmering take a potato masher and mash the beans to your desired consistency. I like using the potato masher because it means I don’t have to take out the blender which means less mess. After mashing add the grated cheese and stir. The cheese will instantly melt. The black bean dip is now ready. Serve in bowls and garnish with some chopped cilantro. The cilantro makes it look a bit prettier and it adds flavor. 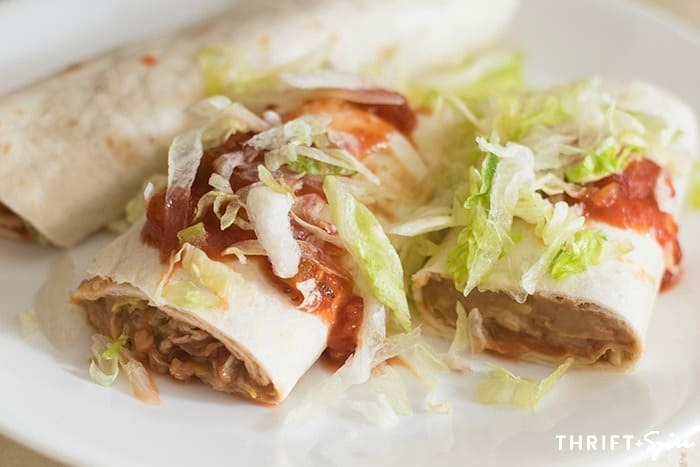 Serve it with tortilla chips, fritos or even pita chips. Homemade tortilla chips would be really good with the dip. I just happened to have some french bread when I made this dip so I just had to try it on the bread. It was amazing. Now that I think of it I think a thin layer of butter first before spreading the bean dip on would be amazing! I’ve been kind of obsessed with french bread lately and eating more than I should of course. 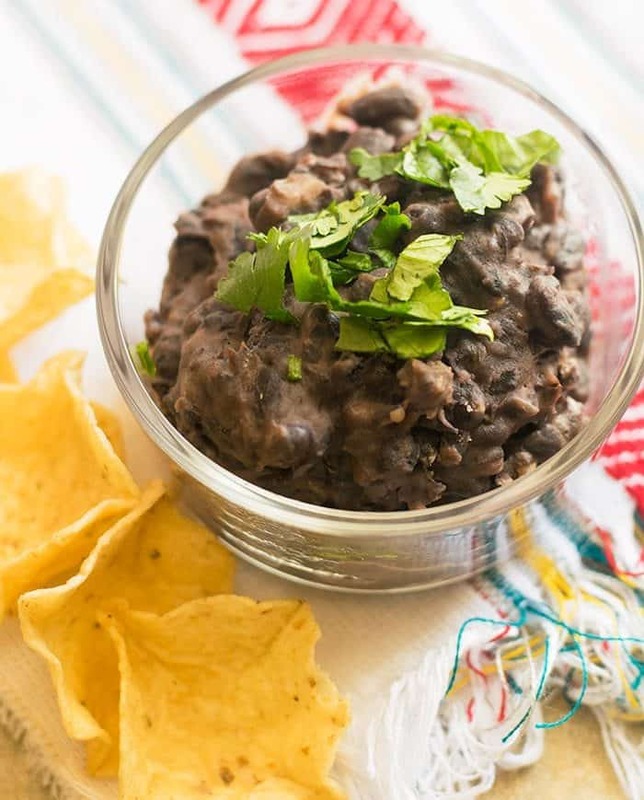 This black bean dip makes for a delicious and quick appetizer when you’re low on time. It takes just 30 minutes or less. It’s inexpensive and can be easily adapted. Make this dip for your next get together and watch how fast it disappears! Heat up the bacon fat in a pot over medium heat. 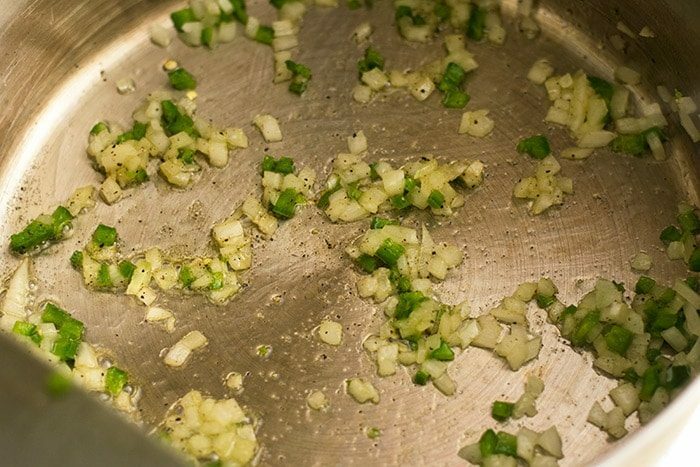 When the grease is hot add the jalapeno and onion and sauté for a couple of minutes. Season with salt and pepper. Open the canned beans and drain one of the cans. Add the beans to the pot. Add the garlic salt and cumin and stir well. 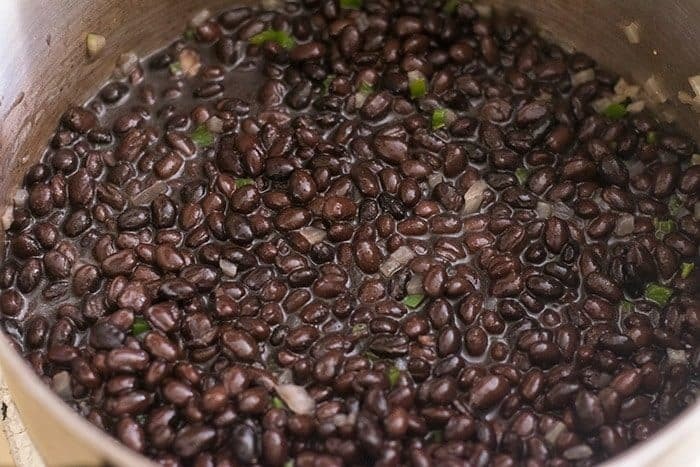 Bring the beans to a boil over medium heat and cover. After simmering take a potato masher and mash the beans to desired consistency. After mashing add the grated cheese and stir. Serve in bowls and garnish with some chopped cilantro. 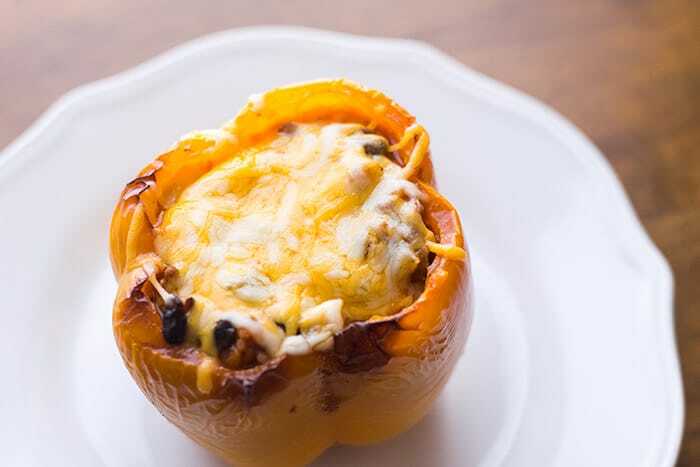 Serve with tortilla chips, Fritos or pita chips. Looking for more dip ideas? Here are a couple!